Ramesh, a 35 year old Sri Lankan, in Hong Kong for 8 years, is on the phone at the window of his shack that he built by himself in a slum in Lam Tei. About forty people live in this slum. Hong Kong, July 2015. Neisha, a 25 year old Indian, in Hong Kong for 5 years, is sleeping in his teeny tiny room. His slum in Chung Uk Tsuen, home to 10 refugees will be destroyed to make way for the future MTR Hung Shui Kiu station. Hong Kong, July 2015. 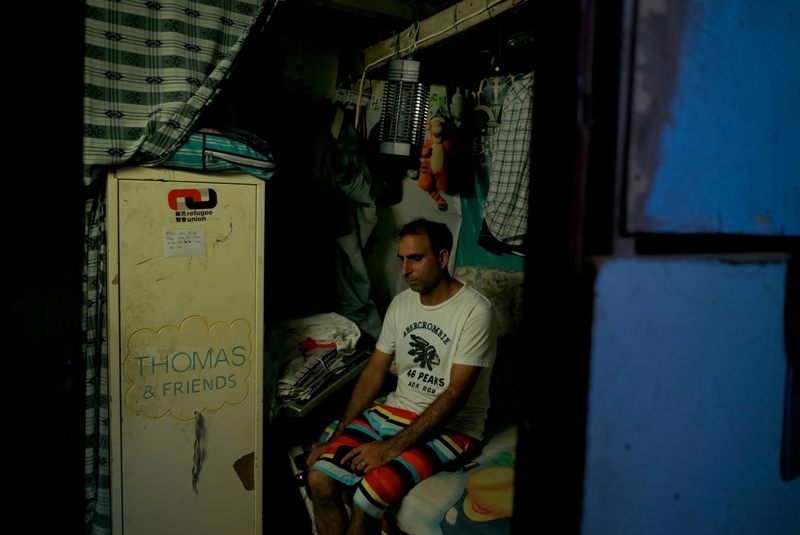 Paula, a 37 year old refugee from Pakistan, in Hong Kong for 7 years, sitting on his bed in his tiny room without windows nor air conditioning in a slum in Lam Tei. Hong Kong, July 2015. Suneisha, a 30 year old Indonesian carries her neighbor's daughter in a slum in Lam Tei. The subsistence assistance provided by the social services is particulary insufficient for families with children. Hong Kong, July 2015. Two Indian refugees are watching television in the room they share in a slum in Nai Wai. 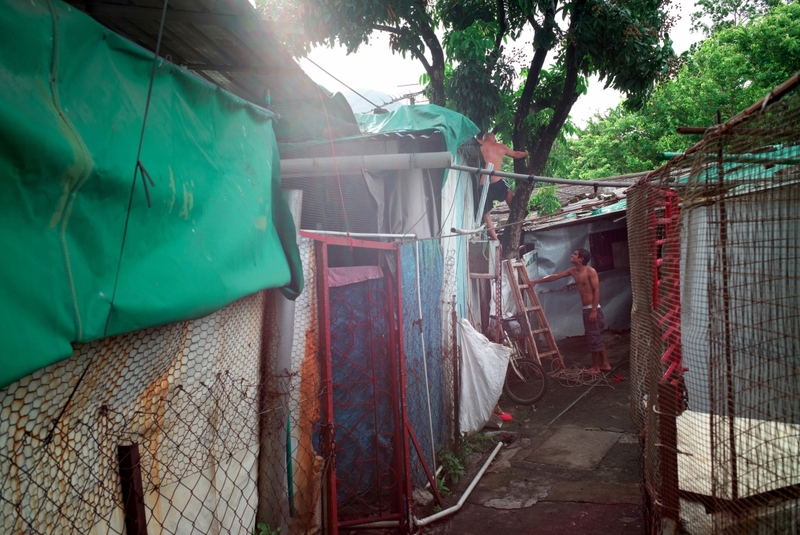 This slum is a former pig farm transformed into housing. Hong Kong, August 2015. 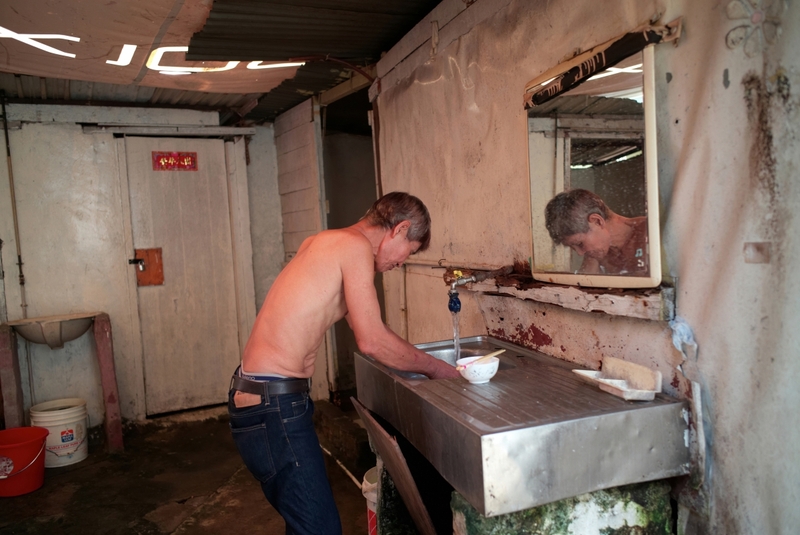 A Vietnamese refugee is washing his dishes in a slum in Nai Wai. 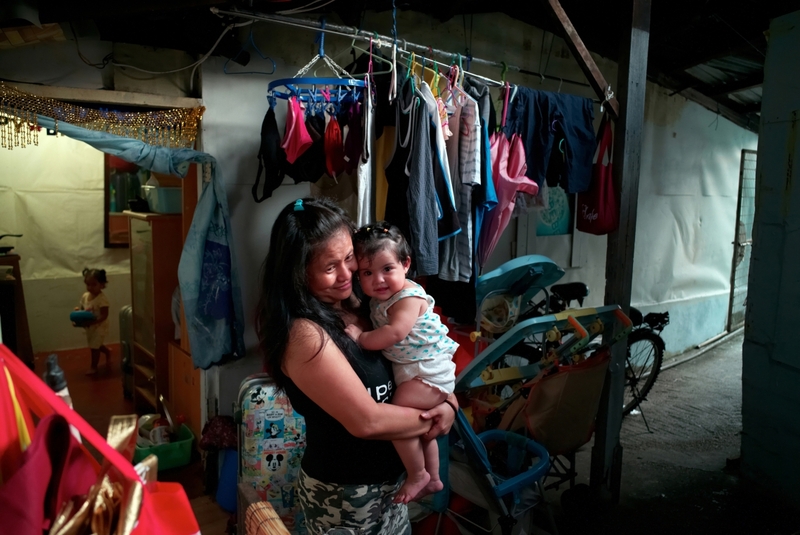 Despite the deplorable conditions in which they live, the refugees take care of themselves. Hong Kong, July 2015. Three young refugees from India are preparing dinner in a slum in Nai Wai. A real solidarity exists between the refugees. Hong Kong, August 2015. Hosen, a 27 year old refugee from Bangladesh, in Hong Kong for 6 years, is fixing the roof of his shack in a slum in Chung Uk Tsuen. Hong Kong, July 2015. 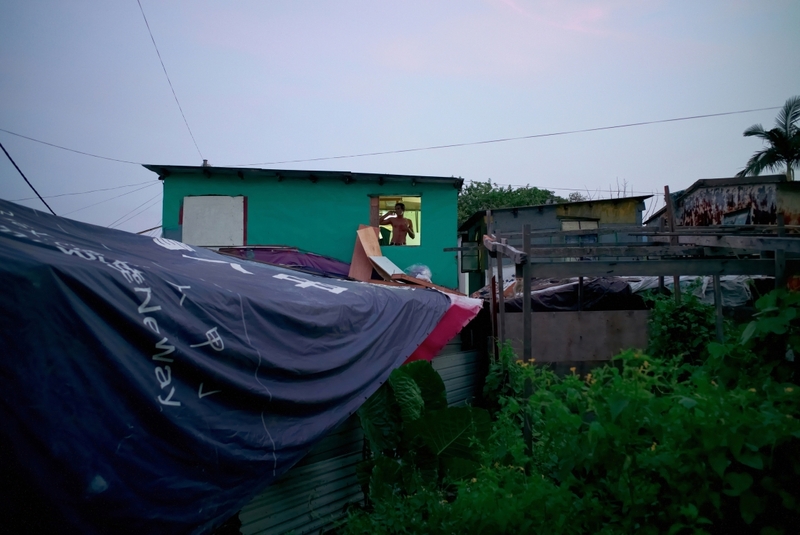 1Ramesh, a 35 year old Sri Lankan, in Hong Kong for 8 years, is on the phone at the window of his shack that he built by himself in a slum in Lam Tei. About forty people live in this slum. Hong Kong, July 2015. 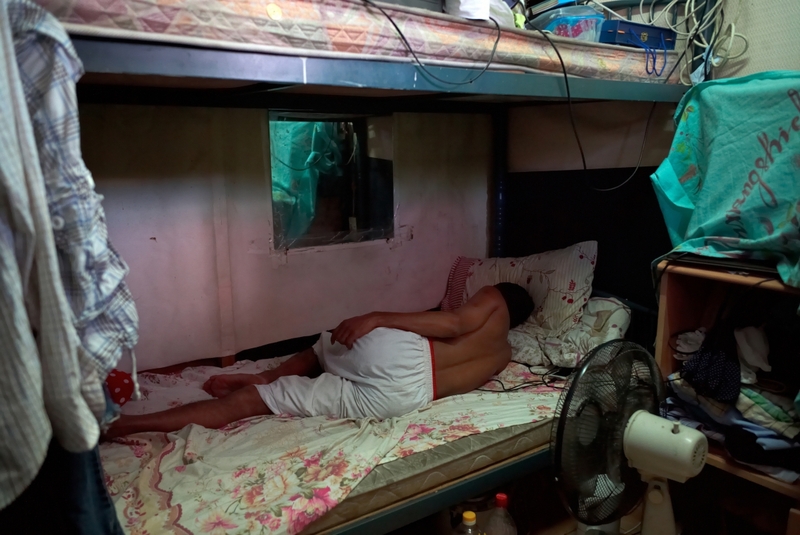 2Paula, a 37 year old refugee from Pakistan, in Hong Kong for 7 years, sitting on his bed in his tiny room without windows nor air conditioning in a slum in Lam Tei. Hong Kong, July 2015. 3Neisha, a 25 year old Indian, in Hong Kong for 5 years, is sleeping in his teeny tiny room. His slum in Chung Uk Tsuen, home to 10 refugees will be destroyed to make way for the future MTR Hung Shui Kiu station. Hong Kong, July 2015. 4Suneisha, a 30 year old Indonesian carries her neighbor's daughter in a slum in Lam Tei. The subsistence assistance provided by the social services is particulary insufficient for families with children. Hong Kong, July 2015. 5Two Indian refugees are watching television in the room they share in a slum in Nai Wai. This slum is a former pig farm transformed into housing. Hong Kong, August 2015. 6Three young refugees from India are preparing dinner in a slum in Nai Wai. A real solidarity exists between the refugees. Hong Kong, August 2015. 7A Vietnamese refugee is washing his dishes in a slum in Nai Wai. Despite the deplorable conditions in which they live, the refugees take care of themselves. Hong Kong, July 2015. 8Hosen, a 27 year old refugee from Bangladesh, in Hong Kong for 6 years, is fixing the roof of his shack in a slum in Chung Uk Tsuen. Hong Kong, July 2015.